Man, that's a really blue rock. After a splendid trip East, I’m back in the Land of Enchantment and already discovering new treasure. Out hiking yesterday, I found two big chunks of very blue rock. I’m no expert, but this is turquoise country. I’ll have to send the photos to a local prospector and see what they think. 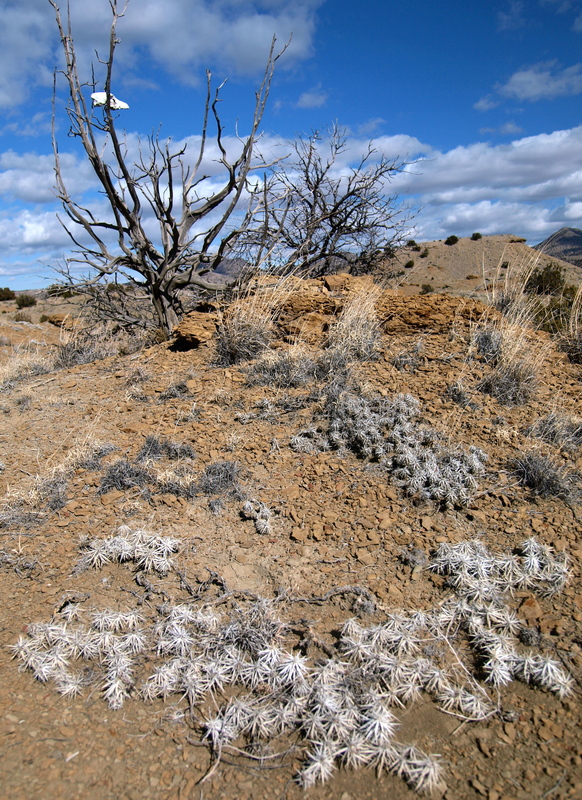 The Cerrillos Hills have been a well-known source of turquoise for thousands of years, beginning with the Aztecs and Mayans, followed by Native Americans and pioneers and into the present day. 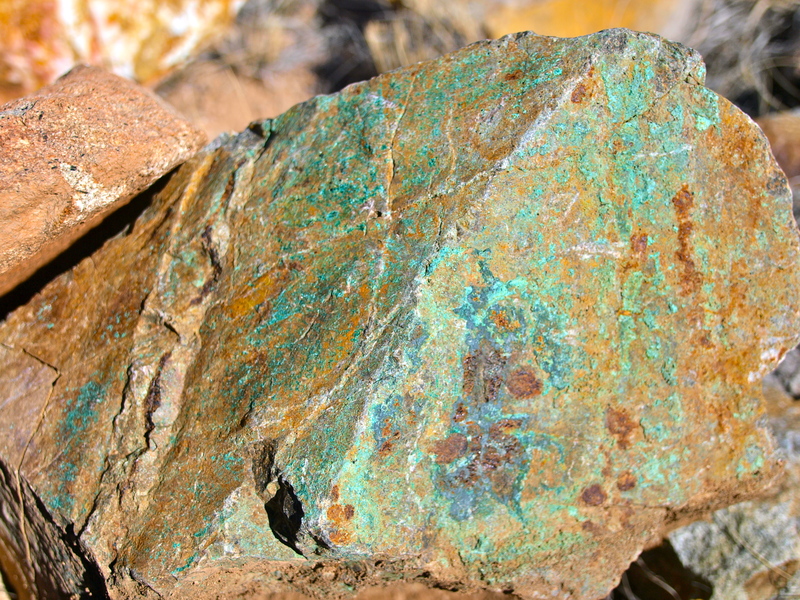 Cerrillos turquoise is distinctive for its greenish tones and stones from this area have been found as far away as Peru. At first, I thought this bright blue must be spray paint, but nope. That's a mineral! This was a great day to return to the desert; we got rain overnight (my cistern is up two hundred gallons) and today the post-rainstorm clouds were amazing! US Geologic Survey Marker, dated 1970. Bowie keeping an eye on me so I don't disappear again. The Blonde Coyote bringing me a bone. Isn't she sweet? 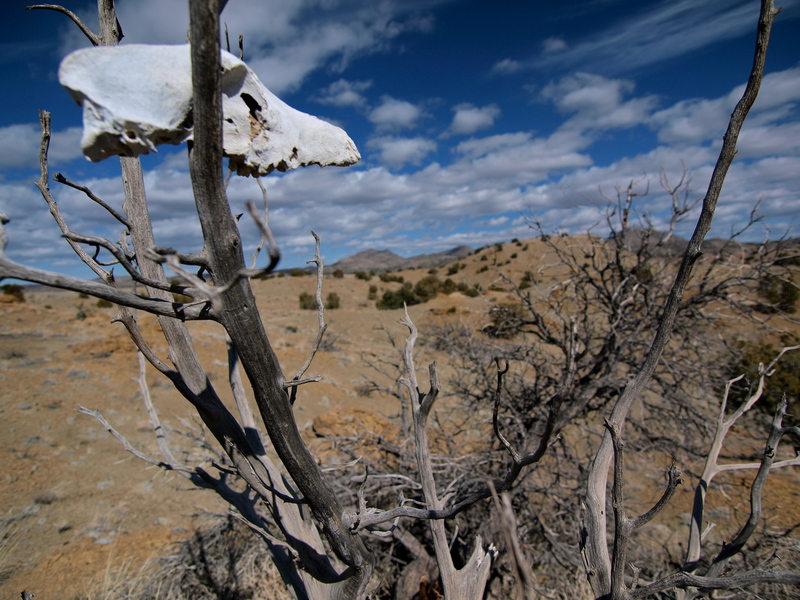 On my hike, I also paid a visit to the coyote skull in the juniper tree. I found this skull years ago, stuck up in a dead tree. I’m sure some other desert traveler left it there long ago and I’m always amazed to return and find it still balanced in the same spot. I’m scheming something epic for this weekend! Stay tuned! 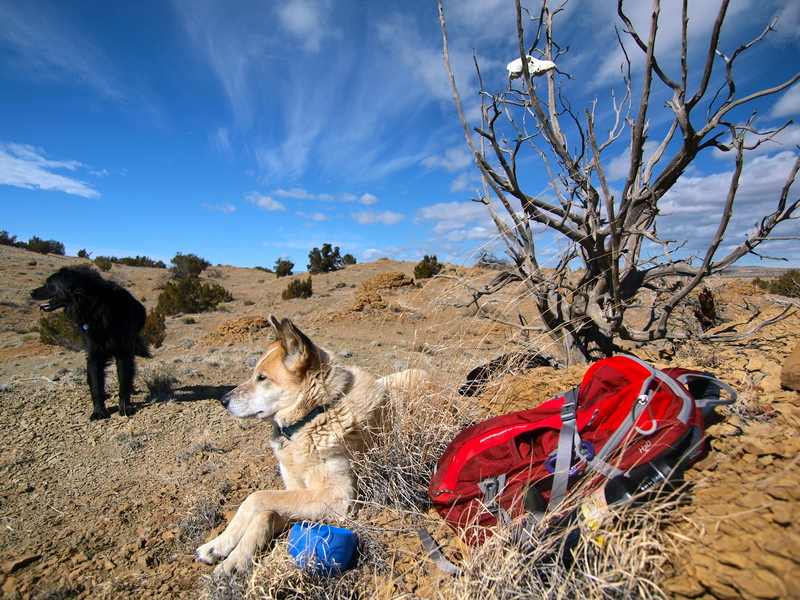 Check out my previous post on hiking in the Cerrillos Hills. I love seeing your photos. Those are the luckiest dogs! Wow! Those are awesome pictures. Really nice. Thanks for putting them on wordpress! Yeah they’re pretty spoiled — a long, off leash hike everyday! All dogs should be so lucky. There’s nothing more beautiful than the desert with a blue sky. Thanks for giving me this glimpse today. Love geology myself! I used to collect rocks and minerals in my younger days and I sill love to travel around my own region (Pacific Northwest) just to check out the landforms and colors in rock stratas. If you ever want to see a color show of your life, trek around the John Day Fossil Beds area in remote Eastern Oregon. I’ve been to John Day! That place is amazing. I wrote a Travels in Geology called Finding Fossils in John Day for EARTH magazine back in 2008. Next time I’m in eastern Oregon, I’ll definitely stop for another visit. Thanks for reading Peggy! Two Freshly Press selections today featuring the beauty of the desert. I enjoyed both posts. You have an eye for beauty and enchantment. Love the dogs too. Geology containing messaging … priceless. These pictures are beautiful! There’s nothing quite like a great expanse of land and an even bigger sky… Thank you for sharing! the cerillos hills and the turquoise road are an amazing pair. i love new mexico high country. your photos show it off very well. 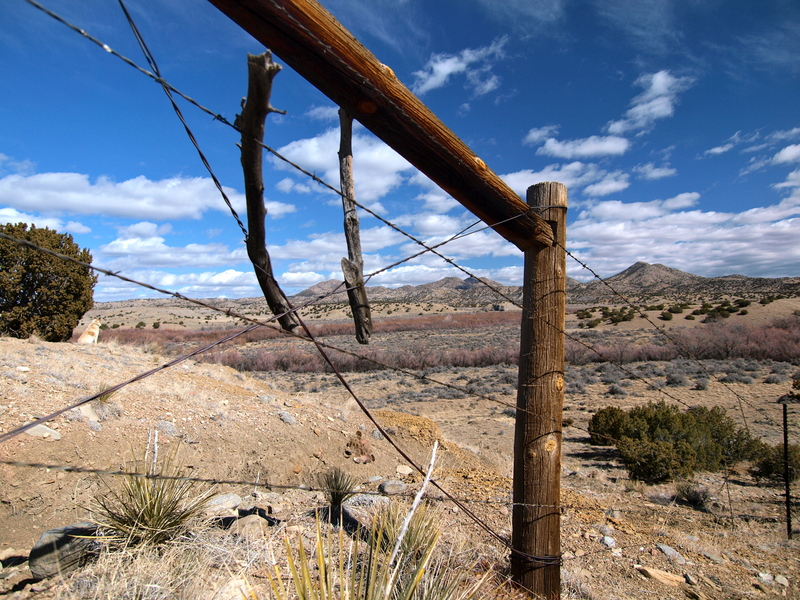 Gorgeous photos and fascinating to learn about the turquoise trail – I didn’t know that, and your post and pictures were a great way to hear about it. BEAUTIFUL photos! I am a WordPress photographer, and you have inspired me. Great job. Thank you! That’s lovely to hear. Yesterday was the second anniversary of my Great Uncle Jim’s passing. He gave me my first camera when I was a kid and these photos are for him! I love NM! Beautiful pictures. Congratulations on being freshly pressed! You’re pictures are great. That is some amazing landscape. You’re “Blonde Coyote” reminds me of my dog, an Akita/Border Collie mix, with different coloring. Absolutely gorgeous…Oh, and your last name ROCKS! Cheers! Haha thanks! I’m quite fond of it myself. Any chance you’re originally from West Virginia? Well then, maybe we’re long-lost cousins. We seem to share the mountain gene! This blog post made my day. 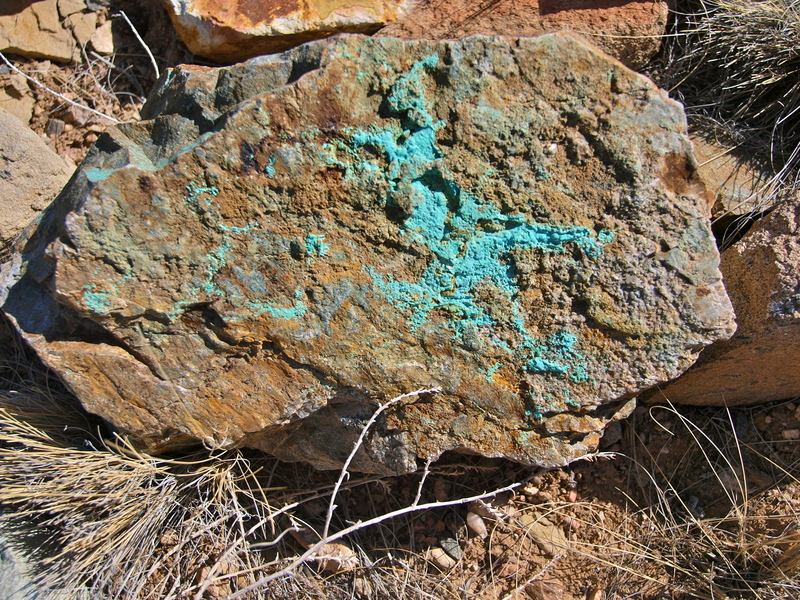 As someone who’s heavily into crystal healing finding a big turquoise like that sounds like a dream come true. All the photos are gorgeous. Happy trails! It makes my day that the Blonde Coyote made your day! This place is amazing and I’m so happy I get to share it. Thanks for reading! New Mexico, land that I love! Great photos! Wow, that really does look like spray paint! Very enticing set of photos. I love seeing those big blue skies, especially this time of year. Thanks for posting the great photos, and I’m going to look up your science articles. I’m currently reliving a trip to the Land of Enchantment from 1970. I’m converting my old home movies into a DVD movie called Searching for Indians and A-Bombs. You have some outstanding photos. Thanks Joe! Did you happen to pass through Madrid in 1970? It’s a pretty wild place now; I can’t imagine it then! Great photos and great blog!! Will enjoy reading more! The coyote is my fav shot! Stunning pictures! It must be so amazing and peaceful to walk around the desert and come back to familiar things you see (the coyote skull). Hope you have a great weekend! We are expecting snow tomorrow here in New Jersey! Brrr! I know those hills well. So nice to be able to hike around in winter and keep your feet dry. Lots of other minerals to be found out there to. For now I’m in Hawaii hiking and thats just fine. Wanted to say thanks for bringing me home for a few moments. Gracias. You’re welcome! Hawaii is a pretty nice place for a hike too! I hope to get back there someday soon. Beautiful photos. Great dogs. Where did all those bowling pins come from? Your photos are beautiful. They make me want to get out and hike! Reblogged this on The Travel Expert. Wow, it’s wonderful to see such beautiful photos of a different terrain! Amazing pictures! Isolated place, but there’s beauty everywhere. Thanks for sharing! My husband and I drove the Turquoise Trail last time we were in New Mexico; very beautiful up there and your pictures are equally beautiful. Particularly interesting was the US Geological Survey marker, I have never seen one before, or if I have, I didn’t know what it was. We have a rock that was collected by my husband’s step-mother (she and his father lived in Roswell before their deaths) and it has blue in it, but I never thought before it might be turquoise. I wouldn’t even mind if it was chrysocolla, which is my “totem” mineral. Thanks for sharing! Enjoyed your post! . 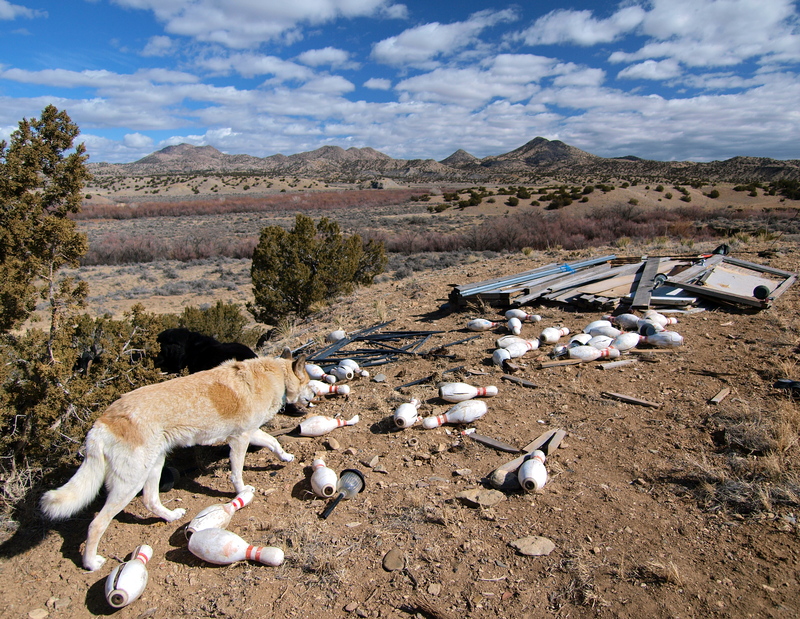 . . Those bowling pins scattered about were intriguing and the story of the coyote skull remarkable! . . . Congrats on being “Freshly Pressed”! Beautiful pictures! That blue on the rock does look like graffiti. When I was in Saudi Arabia years ago, we camped out in a location near where nomads were. There was a goat’s skull in the sand — had to walk right by every time I went to the latrine. Despite so many people being around, not one person touched the skull. It stayed right where it was until we left the area. Lovely photos, they bring beauty to a harsh place. I’m going to visit your blog and read the rest of your blog. You are so amazing. So are those photographs and the dogs! Thanks Dawn! I’m a self-taught photographer too! The more you shoot, the better you’ll get! I’ve come a long way in the past seven years! Gorgeous!!!!!! I miss that land. I lived on a res. in Az. for a while. Similar feel. AI had a solid pack of dogs with me as well. Beautiful shots. 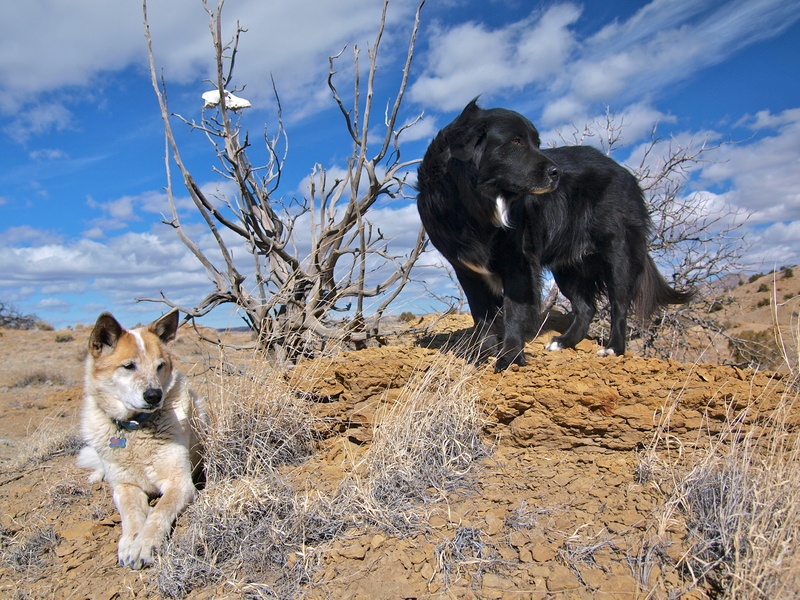 No better allies on the trail than a solid pack of dogs! Thanks for reading! Best compliments from Italy! nice place, nice photo, nice dogs! what a gorgeous view… sounds like a cool hike! thanks for sharing! Cool photos man. You have a great blog going here. Keep it up! I love rocks! I used to collect stones and rocks when we go to rivers or the beach. I am fascinated with their distinct colors and texture. These rocks in your photo, unique as they are reminds me of my collection, which I still keep. At least some of them 🙂 Thanks for the post. Great post. Really like the color in the rocks, very unusual. 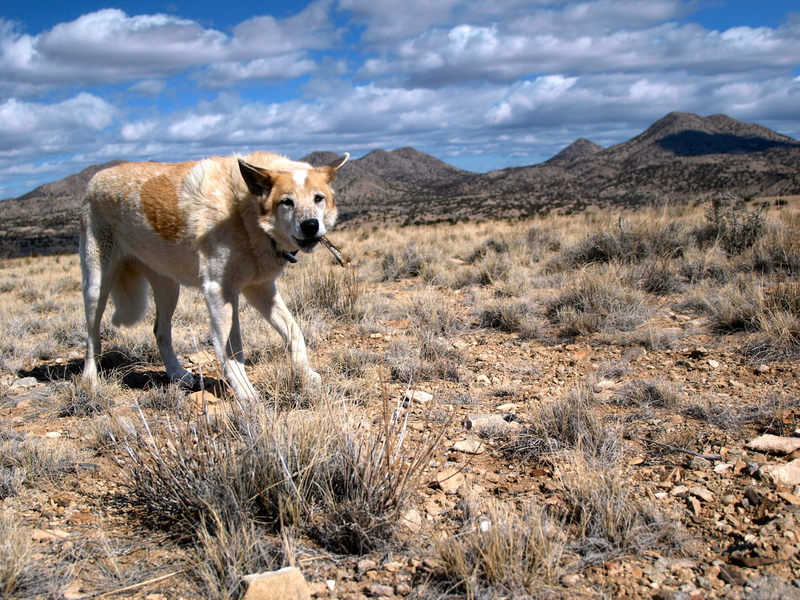 And your dogs are beautiful, The Blonde Coyote looks like he really belongs there, like he’s part of the environment. If there’s anywhere in the world a deaf coyote hybrid belongs it’s here! She was found on a nearby mesa as a tiny puppy, likely abandoned by her coyote mother because of her deafness. She’s one hell of an animal. Thanks for reading! your photographs are amazing! love the colors and composition. also love the simplicity in your writing. I simply love all your photos. Its amazing. Some of the most awesome photos I have ever seen on “Freshly Pressed” postings. why do you so resist the obvious conclusion that coyotes can climb tree and stay put until that bothersome skin they find themselves in disappears and releases them to the sky? How could you so underestimate the wily coyote…I’m sure she enjoyed every second in the tree too…perspective….that’s what I heard the coyote say before she disappeared into the sky daring me to follow…. Ah, my old neighborhood! Thanks for reminding me of the years we lived just south of Santa Fe! Enjoyed this post. Not really a science person, but I really love your photos and writing style. The dogs are cool. I love wide open spaces. I am a Wyoming native living in the South. I miss having a horizontal view. So many trees here on the East Coast. I just visited Santa Fe for the first time .. bought myself a nice turquoise ring made by a Navajo .. and I also visited the Georgia O’Keeffe gallery, which made me VERY much appreciate the desert. I am born/raised New Englander, recently transplanted to Bend, OR. I was so happy to visit Santa Fe on my way out here! Great blog! 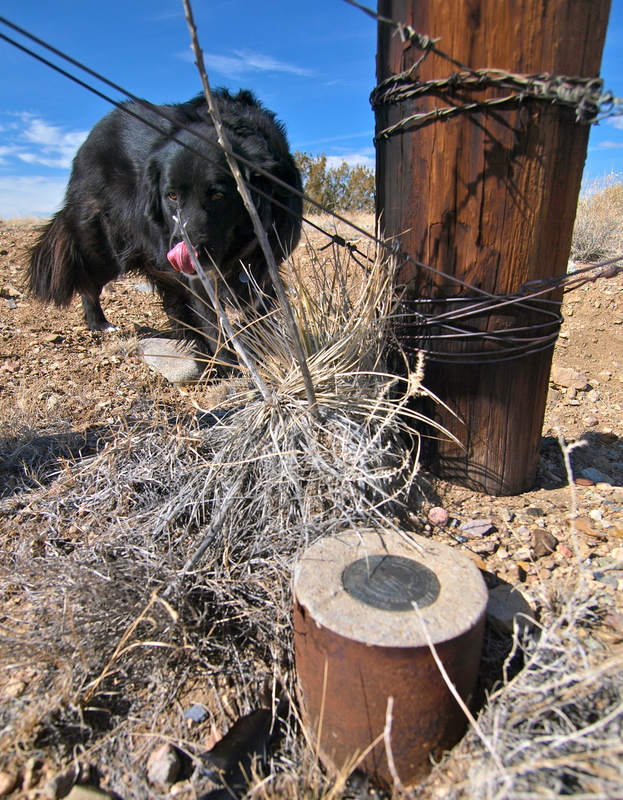 Also – glad you “left no trace”, although IF that rock had been turquoise I would have had a hard time leaving it there! Wonderful photos, thanks for sharing! Nice for us Tennesseans to be reminded of the great wide West! Great post – and congratulations for being in the freshly pressed! I am a Biology graduate also, and I admire you! Was the blue turquoise? Or was it copper or something like that? It was a really beautiful colour whatever it was. Loved this blog post, the animals the colors all of it. Amazing posts! !